In the 1966 film – Daleks Invasion Earth 2150 A.D. , Doctor Who is pitted against his wheeled foes on the battlefield of the human home-world. The Daleks have swooped in and subjugated the local population – making their own shiny-suited bipedal army through some nifty neuro-hacking. The robots (and remember that robot comes from robotnik or slave) carry out their duties for their remorseless cyborg masters in unquestioning unison. Bernard Cribbins’ charater infiltrates the slave caste and we the viewer are treated to his attempts to avoid detection as he joins ranks with the robots. We see him walking in time with the synchronized squad. We see him carrying arms. And we see him at futuristic robotoid mealtimes. This is the enduring image burnt onto my juvenile gastronomical psyche. The robotoids are presented with identical food stuff. Presumably containing all the nutrients necessary for a day of burly bullying. The foodstuff is in tablet form. Easy to eat. Hopefully meals are free from indigestion. The food looks like candy. 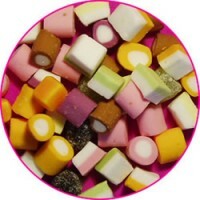 Dolly mixture to be precise. In one scene each roboman puts down their hand to their plate, grabs a meal replacement pellet and in chorus they raise the tablets to their mouths. This to me was progress, especially as a boy who hated wasting time eating food. Progress was the ability to mass manufacture nourishing food and simplify the process of consuming it. Saving time and introducing efficiency. Sure, the world was controlled temporarily by a race of cyborgs that wanted to exterminate the rest of the galaxy’s population, but at least the food was never late, burnt or unhealthy. Portion control was a cinch. Fast food really could be healthy. This is science fiction of 50 years ago, and yet again, science fact has let me down since my childhood. What has the market produced along these lines? Meal replacement shakes that are choc full of unpronounceable chemicals. A mass food supply that is apparently so poisoned and tainted, that I’m better off making friends with a farmer and making all my own food from ingredients that are so real that they’re terrifying to hold. All the uniformly shaped carrots are to be avoided, modern agriculture is trying to kill us, and granola bars are junk. Snickers have lied to us. Fast food is lethal and sugar is the new fat is the new low-carb is the very old Paleolithic food. So what’s left? I’ve never seen that movie about Soylent Green, but now nerds are starting to dissect food and recreate it from the building blocks in off the shelf powders. It’s not quite slave food, but you know what, I’m intrigued. $10 a day and bags of powder I can mix with fishy oil each mealtime – maybe that’s the way forward. The Dalek experiment might not have worked, thanks to Peter Cushings’ Doctor Who, but I’m going to start my own experiment. Less cooking, faster eating. Of course, some Soylent recipes are open source, so I’m going to go the DIY route. I’ll be the change I want to see in the kitchen. I will set robotoids free and eat Food 3.0.